Meet our March Donor of the Month, Beedie Development Group! 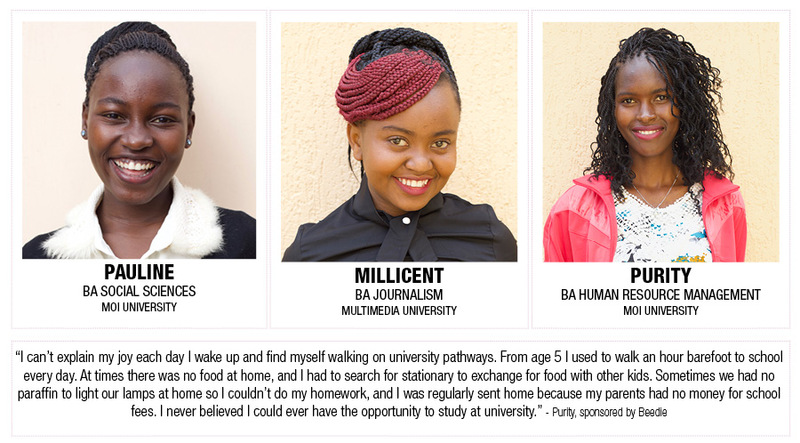 With their sponsorship of three university students, Millicent, Pauline and Purity, Beedie is helping these girls move one step closer to achieving their dreams. Access to education has been a major obstacle standing in the way of these girls’ success, but now they get to wake up every day and pursue an education, making their families proud and allowing them to go forward and change the world! These girls are determined to better themselves and their communities thanks to the help of Beedie. Not only does Beedie sponsor these three girls through their studies at university, Beedie is also a proud platinum sponsor of One Girl Can’s annual #IWant2Be event. This year’s event is set to be bigger than ever, topping the 2017 fundraising total and featuring an exciting live auction, delicious appetizers and moving videos from the girls in Africa. At Beedie, we believe in the power of communities and the individuals who live in them. Our founder, Keith Beedie, instilled his unwavering commitment to giving back in his children, and in the company that bears his name. He would say being involved in our surrounding communities is not only good for business, it’s the right thing to do. That legacy is still our driving force today. Beedie Cares is an employee-driven initiative that was founded in 2014 to raise funds for the Vancouver Sun’s Adopt-A-School Foundation. The fundraising campaign was a huge success, raising over $128,000 to support a breakfast program and extracurricular activities at a local elementary school in Burnaby. The momentum from this success was carried forward, and Beedie Cares launched a companywide employee-driven volunteer program supporting local non-profit organizations with a streamlined focus on supporting youth, seniors and families within our community. The primary goal is to partner with organizations where we can provide both financial funding and volunteer support. These opportunities will allow us to expand our impact and better meet community needs while providing hands-on, collaborative support. Small Dollar, Big Impact outcomes are at the heart of our Beedie Cares philosophy. By targeting local organizations that can greatly benefit from smaller yet more effective giving, we are building stronger communities together. Find out more about Beedie here. Purchase tickets to our #IWANT2BE event here.